Asylum-seekers in Germany often have to take a few hurdles before they are able to start studying or find a highly skilled job. As a result, more and more programmes and initiatives are developing concepts aimed at smoothing the path to education and scholarship. A traineeship, vocational training, a course of studies, even research assistance at a university: numerous possibilities exist of entering a profession in Germany – on condition that you can have the necessary school leaving certificates, documents and a knowledge of German. But it is these conditions that usually block the path of many refugees to universities or to the profession for which they are already trained. Yet many of them bring along good prerequisites: every third asylum seeker over the age of 20 has attended a university, polytechnic or secondary school in his or her homeland, according to a current survey by the Federal Office for Migration and Refugees (BMPF). As a rule, though, their degrees are not automatically recognized. “As professional qualifications are seldom recognized, people with a precarious future are also robbed of part of their past,” remarks Marenka Krasomil critically, who herself has made a virtue of necessity. Since September 2014 Krasomil has been taking part in a coordinating capacity in a very special college: the Silent University (TSU) in Hamburg. This college was set up by academics from all over the world who are asylum seekers in Germany. Money, identity papers, knowledge of Germany, a school leaving certificate and proof that one is worthy of protection – in other words, everything that has to be produced for enrolment or for a job as a lecturer and often entails years of waiting – is not required here. The TSU, the first institutes of which were founded in London in 2012 and Stockholm in 2013 by the Kurdish artist Ahmet Ögüt, and the most recent new “off-sheet” in Mühlheim on the river Ruhr, functions as an education forum without bureaucratic barriers. Refugees and migrants pass on their knowledge in lectures and seminars to interested people who can enrol as students on the website. According to Krasomil, thanks to teaching and learning, people can regain their skills – and with that, their dignity. An idea recently put into practice by the Berlin students Markus Keßler and Vincent Zimmer goes a step further. “We want to grant refugees access to education again, because integration begins with education,” says the psychology student Keßler, born 1990. 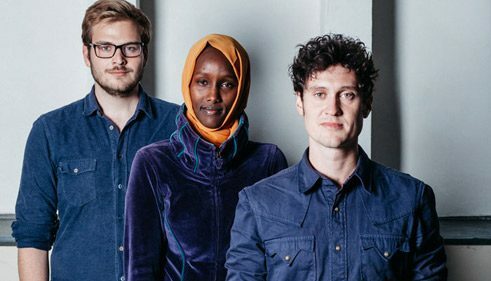 He and some fellow students set up the Kiron University in a back courtyard in Berlin-Kreuzberg – a college that also welcomes refugees without asylum-seeker status and without a knowledge of German. The Kiron University avoids the usual waiting time by using MOOCs – online courses offered free of charge on the internet by English-language universities such as Harvard, Stanford or Yale. The university pays the examinations fees for online courses, for use of the library and a second-hand laptop with a Wi-Fi stick. After two years of specific online learning, by which time students have a knowledge of German and the necessary documents, the objective is to move on to a state-recognised college, because the Kiron University is not permitted to issue certificates. A number of universities, such as the Rheinisch-Westfälische Technische Hochschule (RWTH), Aachen, the Hochschule Heilbronn and the Leuphana University, have already agreed to accept students after the third year. In addition to such initiatives, several research institutions have taken on the task of enabling refugees a future within the German science system. The project Science Initiative Integration by the Fraunhofer, Leibniz Max Planck Societies envisages enabling refugees to gain access to the German research system or to the professional world in Germany through traineeships of up to three months, jobs as student research assistants and training posts. The project aims to smooth the path to the labour market for people entitled to asylum or recognised as refugees but have no training qualifications, as well as qualified persons with a corresponding asylum status. The programme has already been drawn up at the Saxon locations of the Fraunhofer and Leibniz Societies, who hope to soon be supporting up to 150 people seeking protection annually. Fraunhofer and Leibniz institutes in Bavaria aim to start with about 50 places in 2016. Suitable applicants are to be found through orientation sessions and through a regional network of colleges, initiatives and public authorities. According to these institutions, the last stages are in preparation – intercultural training for the future specialist advisors, and training for institute employees who, as mentors, will advise their new colleagues and organise excursions and sports and cultural activities outside the respective institute. Nicole Sagener is a free-lance journalist who lives and works in Berlin. She writes, among others, for “Zeit Online” and “Tagesspiegel”.